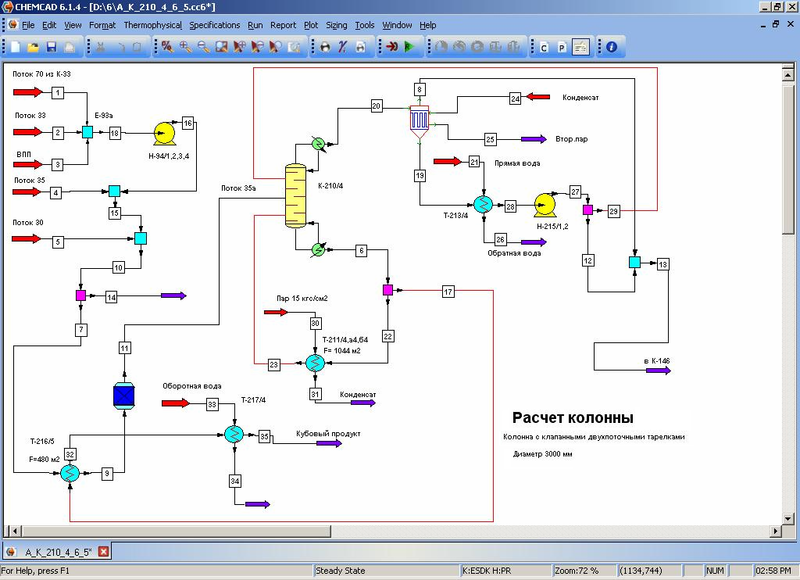 EPC “Ingehim” (EPC “Inzhekhim”, as in some older unofficial documents and affiliations in scientific publications of our employees) offers service in numerical modeling of process flows, plants and apparatuses in the fields of chemistry, petrochemistry, oil and gas refining and gas production. To provide this service, we use modern license software packages (ChemCAD, PetroSIM Express) along with our in-house codes. Our highly-skilled specialists gained vast hands-on experience through working at branch research and design institutes for extensive periods of time in the past, and they also hold scientific degrees in chemical engineering. High qualification of our engineers combined with the state-of-the-art software packages (ChemCAD, PetroSIM Express) and modern computers allow us to bring right to your door our high quality service in numerical modeling. High reliability and accuracy of our calculations has been iteratively noticed by our partners through comparing results of our calculations versus field data for working equipment. Numerical modeling allows optimizing technological processes. This is a step forward compared to traditional engineering techniques and semi-empirical formulas broadly used by engineers in the past. If you choose us to provide you with our service in numerical modeling, you will considerably reduce time and costs for performing designing works stemming from decreases in numbers of industrial tests, and also you will optimize the entire process of designing and manufacturing of your process flows, plants and apparatuses.